Imprisoned Pastor at heart of US – Turkey dispute. Italian Bridge Disaster and the Euro. Residents of a London housing estate compared the place to a ‘warzone’, saying they were too scared to go out of their houses because of the violent gangs that roam the streets. The estate featured in the news after a horrific knife fight which left four teenagers stabbed, two with gaping stomach wounds, as they writhed in agony after ten minutes of utter mayhem on the streets of south east London. Just one of countless news stories of violence and murder that are reported almost every day now, happening not just in run-down inner-city neighbourhoods but also in leafy suburbs and towns and villages of the countryside. A sense of lawlessness and fear is sweeping across Britain, as rudeness, vulgarity and aggressive behaviour become the norm and the authorities lack any power to contain it. Violence is soaring on the streets, much of it fuelled by drugs, demonically inspired music and Internet games and films. Police are grossly overstretched and most crimes unsolved. The prison system is sliding into chaos, as was made clear by the report into Birmingham prison. The Chief Inspector of Prisons, Peter Clarke, revealed that the prison is now an arena of ‘appalling violence and squalor’ where inmates carry out assaults and indulge in drug taking with impunity. Violent offenders are in control while staff are so frightened of attacks that they lock themselves in their offices when they should be out on patrol. Similar situations are happening across Europe and North America. Some of the worst violence is in South America, which suffers 33% of the world’s homicides despite having only 8% of its population. One-quarter of all global homicides are concentrated in four countries – Brazil, Colombia, Mexico and Venezuela. Marxist Venezuela is collapsing into chaos as the currency loses all value and people flee the country to escape poverty and lawlessness. Libya has been in the grip of constant fighting between different factions since Gaddafi was deposed in 2011, one of many countries in the Muslim world being ruined by violence. Since September 11, 2001, more than 27,000 deadly terror attacks have been committed in the name of Islam. White farmers in South Africa are being driven off their land by murders and threats to kill them, while the government plans to take their land without compensation. The farmers have claimed that the government’s plan will be “catastrophic and could lead to anarchy and food shortages like Venezuela or Zimbabwe”. One of the reasons for this state of affairs in Britain is that our education system and media have rejected the restraining influence of God’s law, stopped teaching children to keep the 10 commandments or the basics of the Gospel. Instead they indulge them with liberal leftist dogmas and relativistic morality in which they are told to do what they think is right, with no fear of punishment for doing wrong, either in this life or the next. Tensions between the United States and Turkey have escalated in response to Donald Trump’s tough crackdown on the once esteemed NATO ally. Trump doubled tariffs on steel and aluminium causing the Turkish currency, the lira, to slide in value dramatically. At the crux of the dispute is Turkey’s refusal to release American Pastor Andrew Brunson, who has been detained in Turkey for 21 months on “terrorism” charges – suspected of having ties to the outlawed Gulenist movement – along with alleged espionage accusations. U.S. State Department representatives have called the file against him as entirely uncreditable. Brunson has been living in Turkey for more than 20 years doing missionary work. He is pastor of a church in the coastal city of Izmir (Biblical Smyrna – Revelation 2), which though small, is one of the more flourishing evangelical centres in Turkey, where 99.8% of the population identifies as Muslim. His arrest is part of the general crackdown on any perceived opposition to the autocratic rule of President Erdogan, whose government is waging war against any expression of Christianity in the country. Erdogan has showed no sign of giving in even as his entire economy is on the brink of crashing. Another issue is the fact that Turkey entered into a deal last September with Russia to purchase their S-400 surface-to-air-missile system which would thus require Russian military technicians operating in the arena. This conflicts with Turkey’s status as a NATO member. Erdogan has also held a call with Russian President Vladimir Putin to address their economic links in the midst of the monetary turbulence. Ezekiel 38-9 indicates that Turkey (Togarmah) will leave the western NATO alliance and be allied to Russia in the coming attack on Israel. As its leader Erdogan pursues his anti-Christian and anti-Zionist agenda that appears to be a likely outcome of all this. 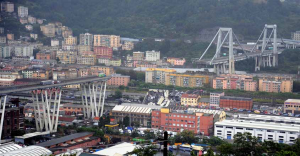 The collapse of the Morandi Bridge in Genoa, northern Italy, took the lives of 43 people and brought disaster to the city and its surroundings as a major transport link was taken down. Questions have been raised about the safety of bridges across Italy, with estimates of thousands of bridges across the country in danger. There are plenty of other reasons for Italy’s financial crisis, but there is no doubt that the Euro currency is the main reason for the massive debt problem in the country (as well as much of Southern Europe). The EU’s “one size fits all” approach to everything is leading to financial and social disintegration, as cash drains out of the Italian economy and leaks into Germany via the banking system. 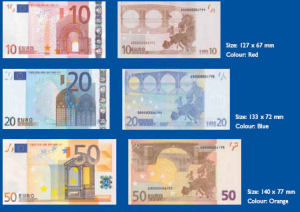 It is then recycled back to Italy through transfers via the ECB’s ‘Target2’ system. This is actually a form of debt, which is impossible to pay back and is leading the country towards radical extremism. This is pure Euro propaganda, which does not translate into the reality of what has happened for the people who have taken on the Euro currency, especially in southern Europe. Now Italy’s Eurosceptic government is potentially closing the ‘windows and doorways’ and bringing down the ‘bridge.’ It is making an alliance with Hungary and other east European nations to stop mass migration into Europe and potentially close the doorway of the EU’s precious ‘freedom of movement’ between countries of the Union. And it has the potential to cause the collapse of the Euro ‘bridge’, as indicated above. So, the image of the collapsed bridge at Genoa which has been seen on news reports across Europe becomes a picture of something much bigger – the potential collapse of the Euro. All of the things we write of in this magazine are pointers to the fulfilment of Bible prophecies of the last days in our day and the soon coming of the Lord Jesus Christ. The most important thing we can do, in the light of this, is to call on the name of the Lord for salvation, so we are ready to meet Him at His coming. Dear Heavenly Father, I admit that I am a sinner and need your forgiveness. I believe that Jesus the Messiah died in my place, shedding His blood to pay for my sins, and that He rose again from the dead to give me eternal life. I am willing right now to turn from my sin and accept Jesus the Messiah as my personal Saviour and Lord. I commit my life to you and ask you to send the Holy Spirit into my life, to fill me and to take control and to help me become the kind of person you want me to be. Thank you Father for loving me. In Jesus’ name, Amen.